As you may know, I started a new job (4/20 marked a full month, of course). This place is a huge step into my career which caused for a huge shift in wardrobe. If you look in my closet, you will find a treasure trove of black leggings, band shirts (mostly The Maine), black leggings, VS PINK yoga pants, a bunch of clothes I hate and don’t wear, and the perfect for any occasion black legging. Obviously, this did not suit my new job’s dress code whatsoever. I needed business clothes fast (Like ended my last job Friday and starting my new job Monday type fast)! And my one interview suit wasn’t going to cut it. On top of needing clothes fast, I needed clothes that were cheap. Transitioning jobs does not leave a lot of disposable income. So, I had to hit the pavement and start finding places that could take me from hot mess to business profess (See what I did there?) 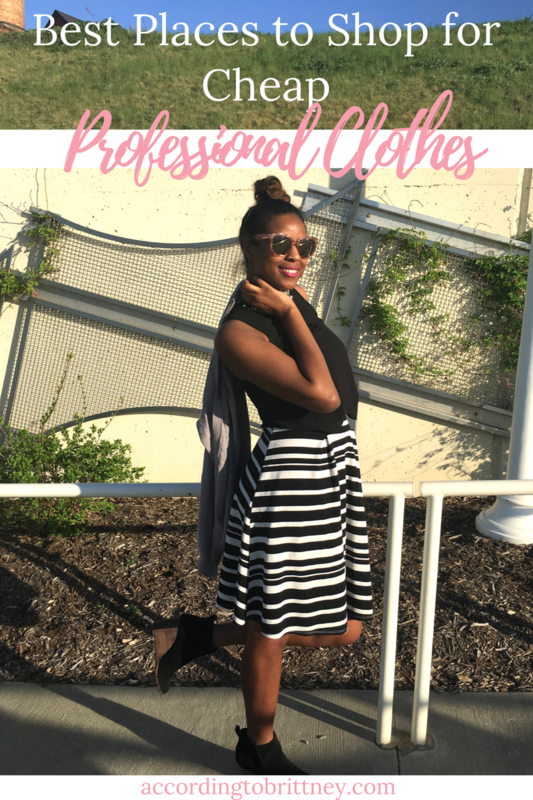 Here are some of my finds for stylish and reasonably priced business wear. I only just discovered Nordstrom Rack but it has done wonders for me! You can get designer clothes for half the price of what they normally are. I’m not much into designer wear, but if that’s you style, you should be shopping here. My favorite thing about this store is the shoes. I have big size 11 feet, so finding shoes can be challenging. Nordstrom Rack has a host of stylish footwear in all sizes. Even for my large feet! I found these cute wedges for work for less than $30! I think that my boyfriend likes these places more than me because of their interesting food selections. But, I do like the deals I can find on clothes. Similar to Nordstrom Rack, you can find designer names for a portion of what they originally cost. For example, I’ve been wearing tiny shoulder strap purses for a while. But, I wanted a large purse that I can fit my laptop in. But, it needed to be cute, not just a computer bag (I don’t travel with my laptop often). Also, I’m really picky. Like super annoyingly picky (Probably should’ve started with that to show you how even I, a picky shopper, can find what I need). Anyway, I found this cute Betsey Johnson purse for $40. I’m not the biggest Wal-mart fan, which probably has to do with my closest one being the worst Walmart in America. But, when I go to a Walmart that isn’t the one I live by, I can find some decent things. Pants are always challenging for me (tall and skinny, the worst two things to be if you want clothes). But, I was able to find some great pants that were under $20! You really can’t beat that. Until the end of time, I will recommend Goodwill or any other thrift store for finding clothes (I really like Unique but the one near me closed). A good majority of the nice clothes I found for work, for both of my jobs, came from a thrift store. I just started shopping at thrift store when I was in a pinch for work clothes. I couldn’t afford $100 shopping sprees. So, I was so happy when I discovered that I could buy nice $6 dress name brand dress pants and shirts. Yes, I’ve found nice professional clothes for as little as $6 that were from nice brands like New York & Company and Express. I know that you may be reluctant to buy used clothes because I was too. But, I’d rather have my money than a new shirt that I’m probably only going to wear to work and eventually never again. Here are some of my best finds! More of an online shopper? I provided links to all the places I recommended so you can find the deals without leaving your home! I’m not much of an online shopper because things never fit me right. Even when I try them on at the store! Looking for more trendy places to shop? Visit my affiliate, Fashionmia, for some cute and cheap blouses starting at $12! Shop around and find something you like! Now, they you have an idea of where I shop, check some of these places out! I’m always looking for the best deal and people say I’m pretty fashionable (hi mom!). Where’s your favorite place to shop? Tell me in the comments!